My mild obsession with earth ovens has now reached the point where we may be the only family in the land to have 2 ovens. 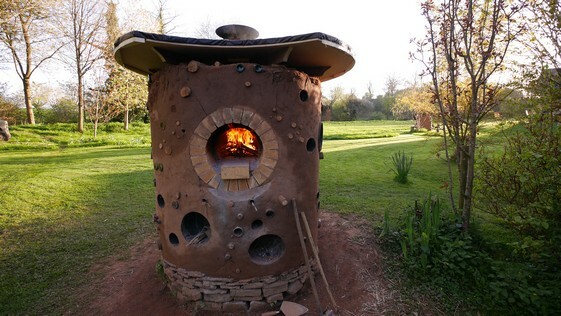 This spring I’ve built another in our garden for the use of ourselves and any keen guests – as far as the actual oven’s concerned, the only difference is a change in chimney and door design, so that when the oven door is closed, the chimney is blocked off, and heat can’t escape so quickly. That’s the theory, anyway, though it’s still drying out, and we haven’t yet quite proved it in the cooking experiments. The oven also boasts a temperature guage set into the door, and a sedum roof….